One of my younger brothers had a quintuple bypass while still in his 40s. Mom had atrial fibrillation and congestive heart failure. She developed Alzheimer’s after requiring six surgeries in 9 months. She died in hospice at the end of 2007, at 84, when her heart gave out. Now, I grew up skinny. In college, at 5’10”, I weighed 120, and when I turned 30 just 125. My boyfriend’s good, healthy cooking raised my weight to a perfect 132. My blood pressure and cholesterol levels were always perfect. Then I was prescribed Elavil (amitriptyline) for a sleep disorder and gained 30 pound very quickly, till people were asking if I was pregnant (how rude!). Miserably uncomfortable, I quit taking it and lost 40 pounds thanks in part to my boyfriend’s sudden death. I was back to 125. Full-blown depression put me on Prozac (fluoxetine), and in three years I’d gained 20 pounds. Then, after my diagnosis of bipolar disorder, came the killer – Seroquel (quetiapine). 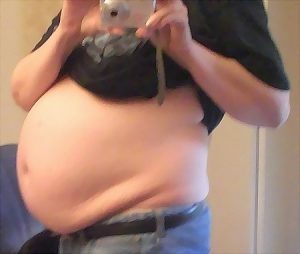 I gained weight up to a staggering 205 pounds. Blood pressure and cholesterol roared up and required medication. I developed adult onset diabetes (borderline). And I was SKINNY at age 40! Almost all the extra weight went to my belly and thighs. The lowest I’ve managed to get to is 170 since then, and I wasn’t able to keep the weight down when I got there. I look 9 months pregnant with quintuplets and feel horrible. The fact that I’m also 2 1/2 to 3 inches shorter makes the weight gain proportionately even more significant. So yes, I have a genetic predisposition to coronary artery disease. What I don’t know is whether I would have severe trouble with arteries if I had not gained all this weight. My brother was not overweight when he suddenly needed bypass surgery, and he exercised regularly to boot. But I also know that I only needed medication for blood pressure, cholesterol and diabetes after psychiatric medications caused massive weight gain. Bottom line: I feel fine – but I’m scared anyway. This entry was posted in Bipolar and Mental Health, Health by Echo. Bookmark the permalink.